Responding to the National Grid’s announcement that pylons are to be replaced with underground cables to improve scenery in Snowdonia, New Forest, and the Peak District, Ynys Môn Assembly Member Rhun ap Iorwerth has said that the same consideration should be given to Anglesey’s environment. “This is recognition of the need to ensure that our environment is protected. By announcing this investment in national parks, the National Grid are admitting – rightfully so – that consideration needs to be given to more than just cost. Anglesey may not be a national park, but as we face having a second line of pylons across the island, the Grid must acknowledge the damage that that would cause and look again at how we can seek an alternative solution. “Responding to a letter I sent to DECC, Minister Lord Bourne said that it is necessary to ‘strike the right balance between mitigating impacts of new infrastructure and costs…as well as the need of local communities and the country as a whole’. 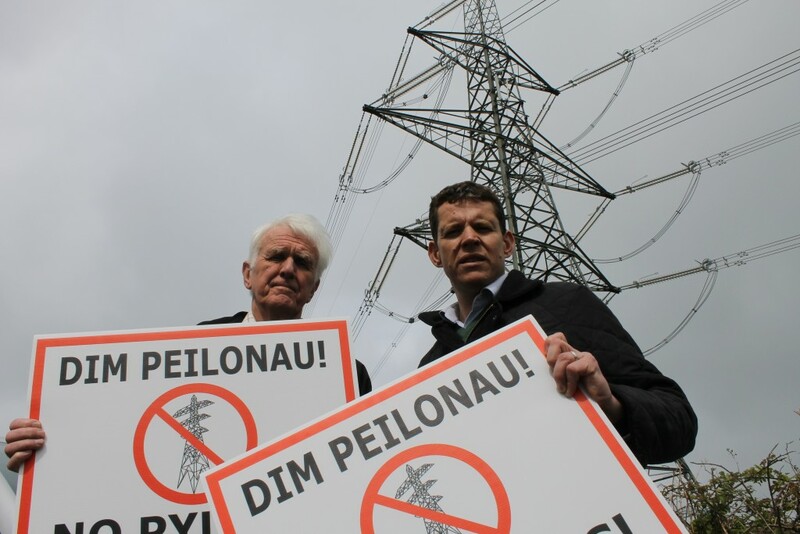 Rhun ap Iorwerth said: “Under current National Grid plans for a second row of pylons, ‘mitigating impacts’ and ‘local communities’ – communities on Anglesey – are barely a consideration.